I won't dispute the fact that I am a nerd, but if you called me a weather nerd I'd probably mildly protest. You won't find me debating whether the puffy cloud up there is a nimbus or a cirrus, and I'm not the type to while away my day watching the weather channel. However, if you looked at my app history, I couldn't blame you if you thought I was a little obsessed about weather apps. I've probably downloaded at least a dozen of them, most of them I only used for very short period of time before reverting back to the stock iPhone app and Dark Sky. So what's my beef? Why have I rejected nearly every app I've tried? It seems that every app would fall into one of two unacceptable categories. 1. 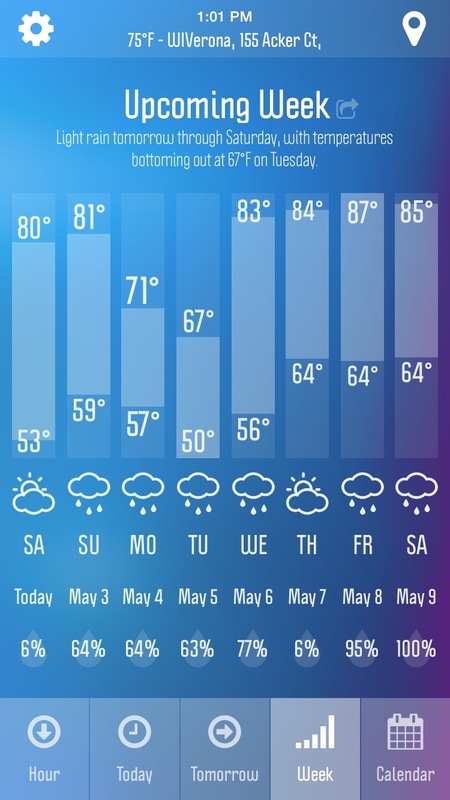 The app that goes into a ton of detail about the weather, but makes me dig around multiple screens before I know if I need my coat or my umbrella today. 2. 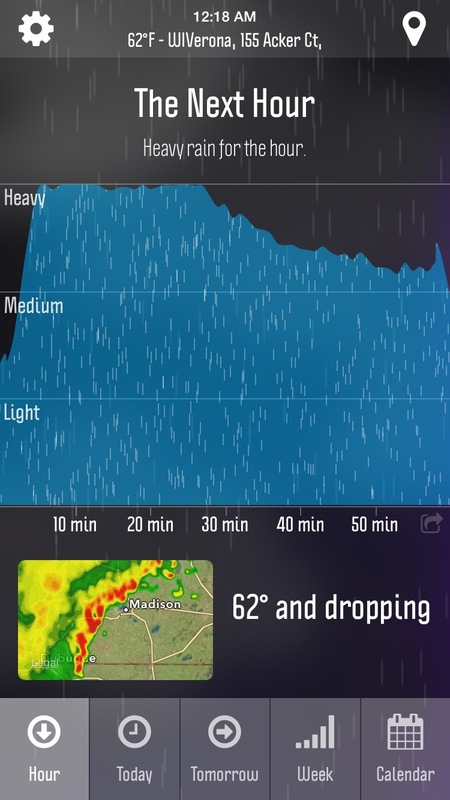 The app that immediately tells me the temperature and the rain, but I have to dig too deep to get the details. What's the dew point gonna be today? Will I be sweating through my dress shirt on the way to work this morning? A couple weeks ago yet another weather app caught my eye and I felt compelled to buy it, as I am prone to do. The app, WeatheNerd, definitely had a name and an icon that appealed to me but I figured it was destined to end up in the same graveyard that the rest of my discarded apps have ended up. My first impression was that this one definitely had an attractive interface. It gave a nice line graph of the days weather, and had a nice animation of the probability of the rain throughout the day, as well as spinning windmills to indicate the wind speed. It also had the current temperature in a big font at the bottom of the screen, with highs, lows, dusk and dawn time, humidity, and other pertinent data available at a quick glance. It also gave a quick summary of the temperature: "2 º cooler than yesterday"? How helpful! The biggest thing I want to know when I check the weather is, how should I dress my kids today? The temperature is nice, but what better reference is there than yesterday? I was there yesterday, and I know now that dressing my kids in snowmobile suits on a 60º day was a mistake. I'm not going to make that mistake again now that I know it's even 2º warmer. I also like the fact that the bar graph has a lighter line that indicates yesterday's temperatures. Again, it gives me a good sense of how similar or different today will be from the prior day. 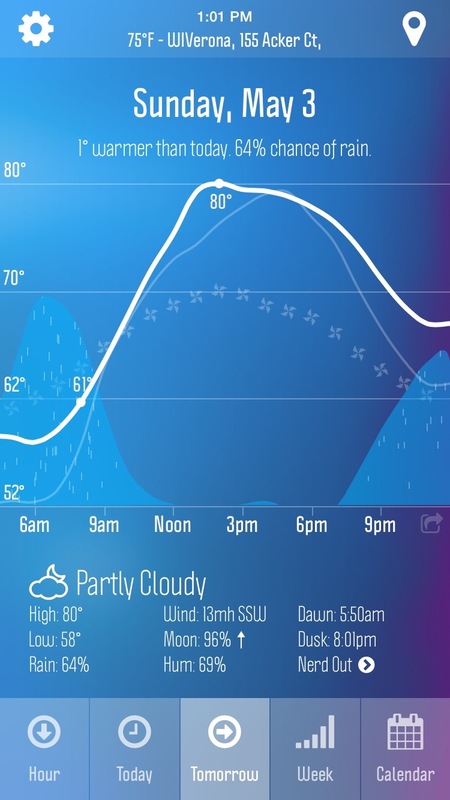 A good app needs to tell you what to weather to expect in the future too. WeatherNerd's tomorrow view looks very similar to the today view and, as a reference, it tells you how the weather will compare to today. Of course, there's a week view with a quicker summer of all days, and even longer term weather predictions. As you get further out it will give you predictions based on historical data, which could be helpful if you're planning a future trip to a different geography than you're used to. Like most modern weather apps, it also incorporates a Dark Sky-like, to-the-minute rain and snow predictions and has local area maps for watching storms move in on doppler radar. Additionally, it can send you a morning alert to give you an early message on what to expect for your day. And, if you really want to nerd out, there is a button named . . . well, "Nerd Out". Clicking it will show all the fine little weather details to make the geekiest weather nerd scream like a little girl. As you might have guessed, I really like this one and I think I've finally found my weather app.